Uber has become so pervasive that the company is changing our vocabulary. In everyday settings, we use Uber as a verb (as in “I’ll Uber to the ball game tonight”). In business settings, we use the term “uberization” or “uberfication” to refer to companies creating on-demand services such as home delivery of groceries or healthcare on demand. The Uberization of our vocabulary is a perfect example of how technology enables a change in consumer behavior. Thanks especially to the uptake of smartphones and apps, consumers are making purchasing decisions faster, and we’re expecting businesses to respond on our terms. The Uberization of our own consumer behaviors explains why Amazon has been embracing the use of automated drones to deliver goods faster and why brick-and-mortar businesses ranging from Nordstrom to Walmart are partnering with ride-sharing services to offer home delivery as well. But is an on-demand world a happier one? On June 2, Walmart’s Chief Operating Officer Michael Bender announced that the $482 billion brand is piloting a grocery delivery program in select markets. Customers using the service will place grocery orders online and designate a delivery window. Walmart personnel will prepare their orders and may have a ride service such as Deliv, Lyft, or Uber deliver the items to the customer’s door. Customers will pay a delivery fee directly to Walmart as part of their online order rather than fuss with paying a driver along with the grocery order. If the process works as Walmart intends, customers will be able to order what they want online once, and all the prep and delivery will occur behind the scenes. As noted on Walmart’s blog, Sam’s Club has been piloting a similar program in Miami since March. Walmart joins a growing list of businesses adopting an approach similar to the delivery services that the likes of Peapod and Webvan pioneered years ago. Uber partners with businesses ranging from DMK Burger to Nordstrom in order to deliver products on demand. In fact, Uber has branded its delivery services with names such as UberEATs and UberRUSH to muscle its way into business-to-consumer delivery for both large enterprises and small businesses. Panera Bread and Starbucks make it possible for customers to order and purchase food and beverages for pick-up in the restaurants, which is especially useful when customers want to bypass lines during peak hours. A company known as Ritual extends the order-and-pickup concept in an interesting way: the service matches restaurants with companies whose (apparently extremely busy) employees want to preorder food for pick-up to bring back to the office. Online platforms such as Pinterest have developed buy buttons that remove friction from the research and ordering process for merchandise — thus making content creation platforms commerce platforms. Buy buttons essentially introduce to the digital world the same kind of instant purchasing and reordering capabilities that Amazon launched with the Dash button in 2015. As noted, Amazon is moving forward with drone delivery. Walmart and Domino’s Pizza are testing drone delivery, too. But Amazon is doing a lot more than develop a drone delivery service. In addition to introducing the Dash button, in 2015 Amazon introduced Echo, a device through which consumers can manage their homes with a voice-activated device — including, inevitably, the ordering of home-delivered goods. Domino’s and Amazon have partnered to facilitate the ordering of pizza from the Echo device. Google is in a league of its own when it comes to encouraging the on-demand economy. In 2013, Google began offering its own on-demand delivery service, Google Express, in select markets. In 2015, Google unveiled “Purchases on Google,” which are buy buttons embedded in mobile ads. In 2016, Google announced the availability of Google Home, a voice-activated product that puts Google on par with Amazon Echo. When Google Home launches, the product will rely on Google’s new Google Assistant intelligent search tool to make deeper, conversational, and intelligent searches — which will, of course, include the ability to search for things to do, places to go, and things to buy, on demand. Google also announced it is working with Levi’s on Project Jacquard, which explores how to make everyday objects such as clothing and furniture interactive surfaces. It’s not difficult to picture Project Jacquard turning our clothing into ecommerce engines via sensors. What do these on-demand services have in common? For most of them, the answer is “mobile.” We check our phones 150 times a day, and nearly seven out of ten of us check our phones within 15 minutes of waking up each day, according to Google. According to the 2016 Internet Trends report by Mary Meeker of Kleiner Perkins Caufield, smartphone users in the United States spend about five hours a day on our smartphones, and we use 12 apps a day (out of 37 we have installed on our phones). Increasingly, we also use our smartphones to make purchasing decisions. Since 2013, consumers have preferred using their mobile devices over laptops and desktops to interact with retailers online. And mobile consumers have strong purchase intent: Eighty percent of consumers who use smart phones to search for goods and services locally end up making a purchase. Mobile consumers also have an immediate intent to purchase: according to a recently released report by Google, I Want-to-Go Moments: From Search to Store, half of consumers who conduct a local search on their smartphones visit a store within 24 hours. Nearly half of consumers trying to decide on a restaurant do their local search within an hour of actually going. About 76 percent of people who search on their smartphones for something nearby visit a business within a day and there has been a 2.1x increase in mobile searches for stores open now and food open now within the past year. Google calls these moments of decision making “micro-moments.” During micro-moments, we’re using our phones to make quick decisions about what to do, where to go, and what to buy. And we’re open to suggestion from brands. Uber understood the rise of micro-moments long before the term existed. Uber tapped into a common need — we don’t like to wait when we need a ride somewhere — and a natural human behavior: using apps on our mobile phones. With an app, we can easily order a car so efficiently that it’s laughable to think of how we ordered cabs before Uber came along. Uber tapped into a technology-enabled behavior at the right time. Since its founding in 2009, Uber is now a $62.5 billion company servicing 449 cities in 66 countries. These days there’s an Uber for holiday renting (Airbnb), an Uber for groceries (Instacart), an Uber for tailors (zTailors), and even an Uber for private Jets (BlackJet). And if the trend toward the consumerisation of enterprise technology continues, we’ll soon be talking about the Uber for containerised shipping, or even an Uber for factories. Love it or loathe it, the Uber-fication of everything has shifted people’s expectations of the businesses and services they use. And customers are embracing it in droves. The always on, always connected “smartphone revolution” has made convenience, efficiency, and simplicity critical ingredients in purchasing decisions. Smartphone usage first became popular via messaging services, news, and gaming, and now, mobile commerce is following suit. Everyday purchasing driven through smartphones will result in one of the most transformational shifts in consumption patterns in history — never before has a consumer been able to buy anything they want at anytime with simply the tap of a button. Mobile will continue to stoke the rise of the on-demand economy, but not forever. 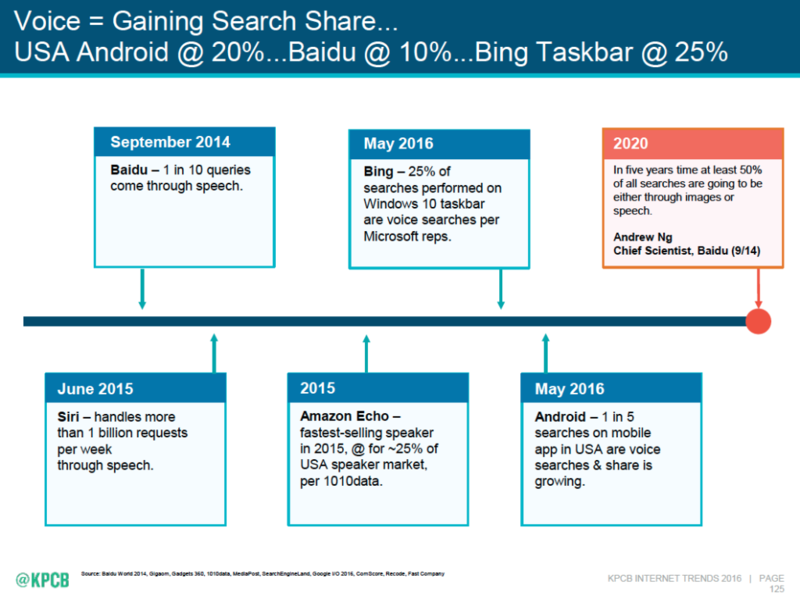 One of the reasons voice search is taking hold is that speech recognition technology is getting more reliable. And with Google building a more intelligent search agent through Google Assist, we can make more pinpointed requests for goods and services on demand (“I want three seats reserved for the 8 o’clock show of Captain America: Civil War at Yorktown Theater”), and amend those requests, expecting Google to adapt to our needs (“I changed my mind — make that four seats for the 9:30 show of X-Men: Apocalypse at Seven Bridges Theater”). Voice searches, layered on top of mobile, combine two familiar behaviors — talking and using our phones — to make on demand micro-moments more natural and ubiquitous. 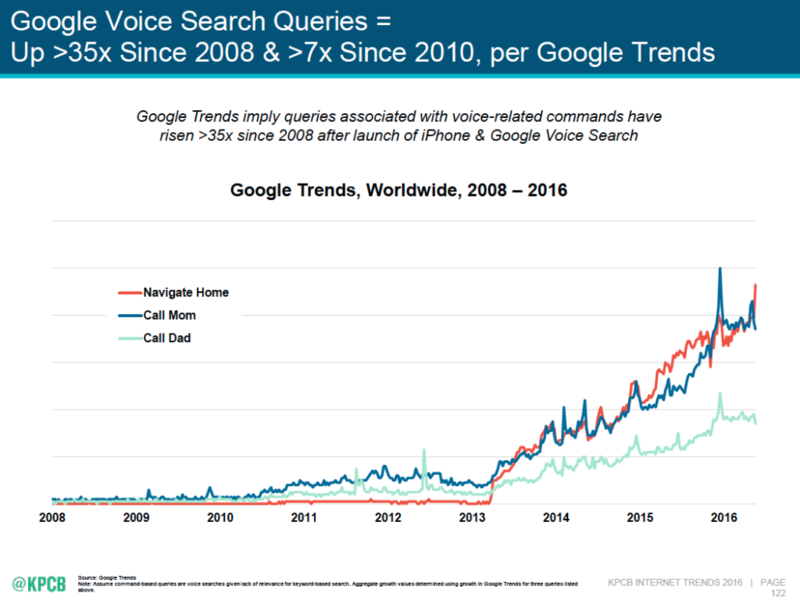 Voice-activated search is not tethered to mobile phones. We use our voices everywhere. Get ready for on-demand everywhere. At one point, though, does a law of diminishing returns for on-demand living set in? When does getting what we want on demand become synonymous with being disappointed? Living in an on-demand world creates an expectation that we can get what we want when we want it — an expectation that cannot be met all the time. Our Internet goes down just as we are about to stream a movie. The restaurant we thought was open when we did a Yelp search is closed for a special event, or someone posted the wrong hours on its listing. When we are conditioned to expect that our every wish is fulfilled on our own terms, having to wait until our service is restored or until we find another restaurant becomes even more painful. 49 percent were dissatisfied with the experience when buying from a retailer on their smartphone when in one of their stores. And yet 82 percent said that finding what they want online is either very easy or quite easy. The survey suggests that retailers have work to do meeting our on-demand expectations. When they fall short, as they inevitably do, we are disappointed. And digital creates an expectation that, at some point, cannot possibly be satisfied. But retailers cannot fix everything. Perhaps the answer is to realize that we cannot always get what we want — on demand, at least. This entry was posted in Customer Service and tagged Amazon, buy buttons, David Deal, drones, Echo, Eptica, Facebook, Google, Google Assistant, Google Home, Kleiner Perkins Caufield, Mary Meeker, micro-moments, Mike Jaconi, Panera Bread, Pinterest, Project Jacquard, Ritual, RRE Ventures, Starbucks, Steve Schlafman, Superhype, Uber, UberEATS, UberRUSH, Walmart. Bookmark the permalink.